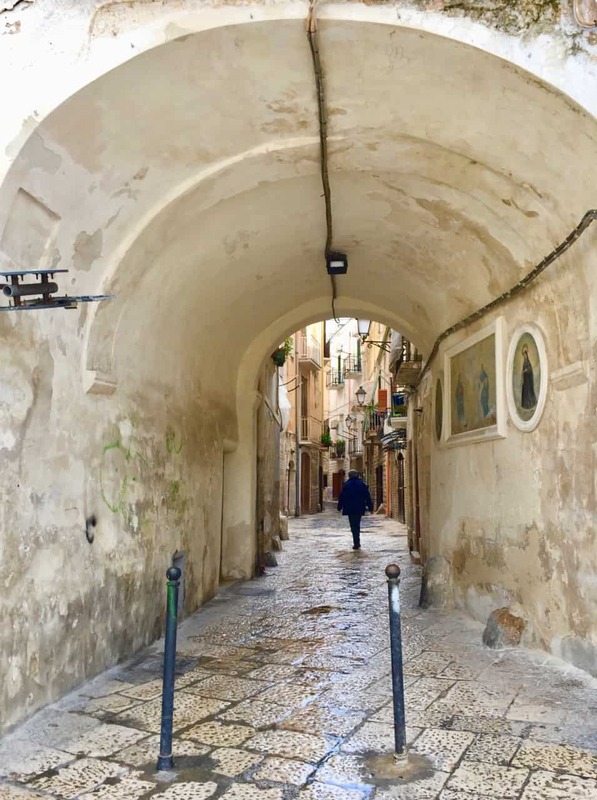 Entering the maze of streets in the Old Town of Bari. Bari is the capital of the region of Puglia and is situated on the Adriatic coast in the ‘heel’ of southern Italy. This ancient city can trace its roots back more than 2,000 years when it was founded by the Peucetii tribe. It grew in importance under the Romans who developed its harbour. These days, Bari (map) is one of the most important economic centres in southern Italy and, due to its international airport and port, an important gateway to the region. 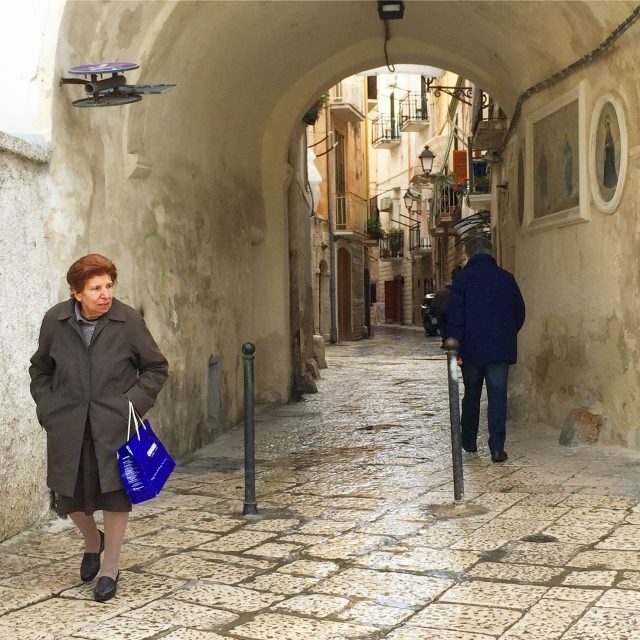 On my first visit to Puglia a few years ago, I arrived at Bari Airport but skipped the city. On my recent visit, I decided to spend two days in the city before visiting other parts of the region. 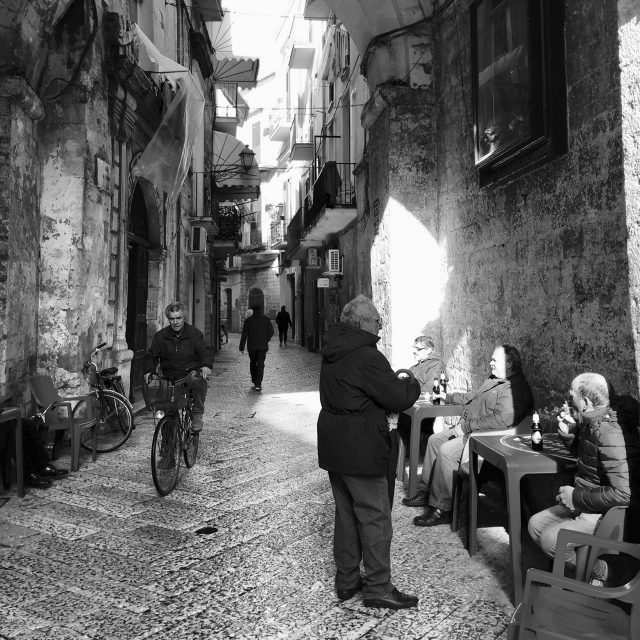 I soon discovered that there are lots of things to see in Bari, especially in its historic Old Town (Bari Vecchia). Bari has a charming historic centre that sits on a peninsula. This area is surrounded by the sea on two sides and the neat grid of streets of the 19th century Murat district on the land side. Friends of mine who’d been to Bari before told me to spend as much time as I could exploring the Old Town so that’s what I did. The Old Town is literally a maze! 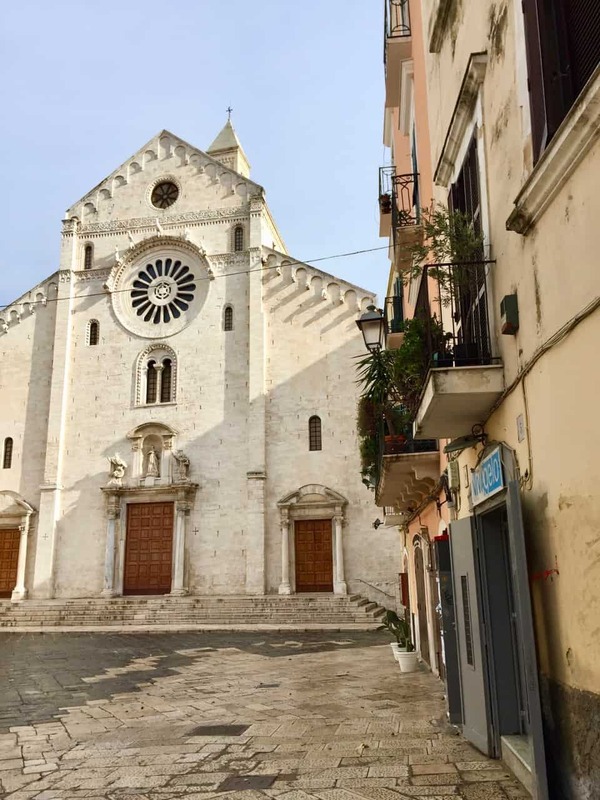 I had a map with me but I simply wandered around and it was such a joy to discover little churches, picturesque alleys, bustling cafés and impressive squares, and soak up the atmosphere. I started my stroll at the 13th century Norman-Swabian Castle. The castle is open to visitors. From there, I picked one of the historic portals to enter the Old Town. And continued my stroll around the Old Town’s maze of alleys. Sometimes, it felt like I’d taken a step back in time! I soon stumbled upon the Cathedral of San Sabino. 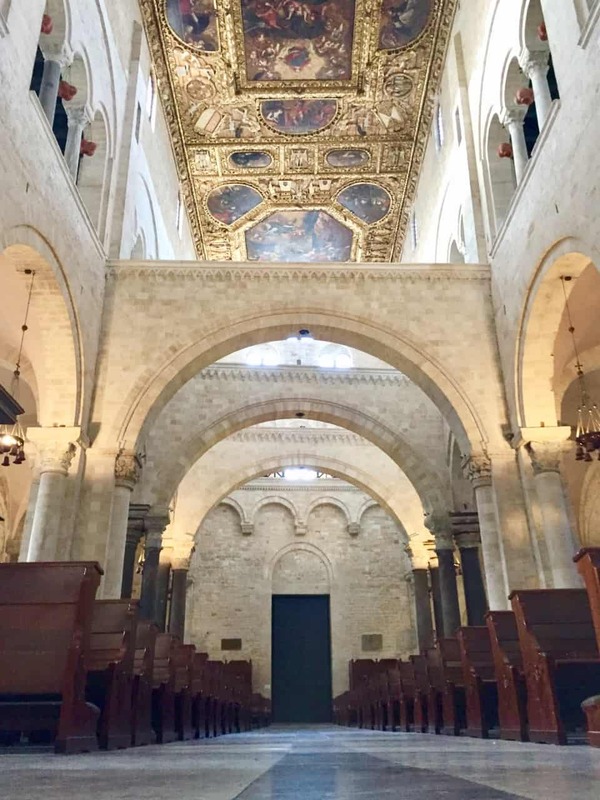 This 13th century Romanesque cathedral, with its ancient relics, is one of Bari’s most important attractions. Alas, it was closed when I was there so I continued on my stroll. The maze of alleys was a joy to explore! I turned a corner and found the iconic Basilica of St. Nicholas, an important pilgrimage destination. The interior of the 11th/12th century Basilica of St. Nicholas, with its breathtaking ceiling. 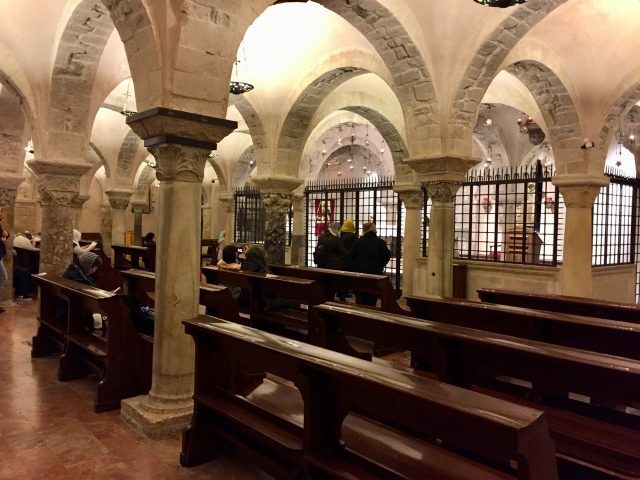 Pilgrims in the crypt of the Basilica of St. Nicholas. From the Basilica, I continued along the ancient Via Venezia road. This road forms part of the city walls and skirts the edges of the historic centre along the harbour front. I ended up at the grand Piazza Mercantile, with its many restaurants, bars and cafés. 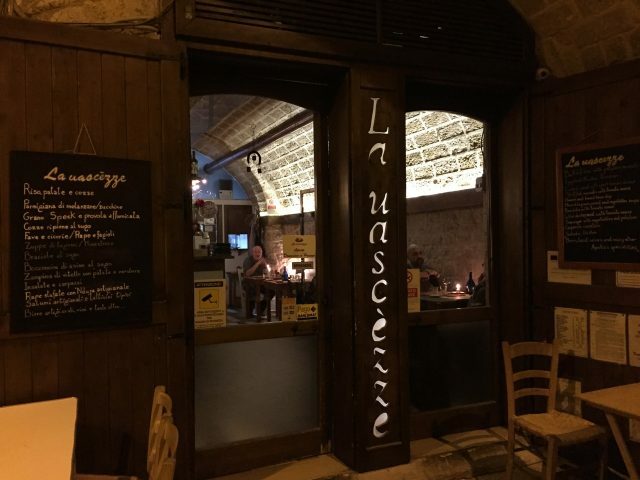 I followed up on a friend’s tip and found the La Uascezze restaurant, tucked away in an alley near Piazza Mercantile. I walked in and was warmly welcomed by the owner. He sat me down and asked me if I had any allergies. I said ‘no’, to which he replied that I will be served whatever the chef was preparing that evening. It turned out to be a gorgeous selection of cheeses (that ricotta cheese was mouthwatering good!) and prosciutto, and delicious potato and meat casseroles. I couldn’t wipe that grin off my face! La Uascezze is tucked away in a side street near Piazza Mercantile. After a terrific dinner, I discovered a little street off Piazza Mercantile called Via Manfredi Re, which was packed with restaurants, cafés and bars. I walked down this street and found Chat Noir: a cozy, quirky bar with a warm, inviting interior. 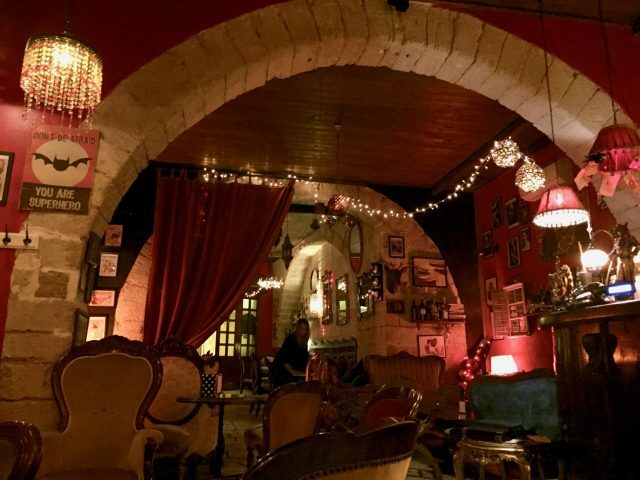 Chat Noir has a gorgeous interior with many details. I ordered a glass of Primitivo wine and just gazed at the intriguing interior. On my way back to my hotel, I couldn’t help but laugh as I got lost once again in the maze of streets. I found my way eventually but the charming, atmospheric streets were so worth getting lost in! 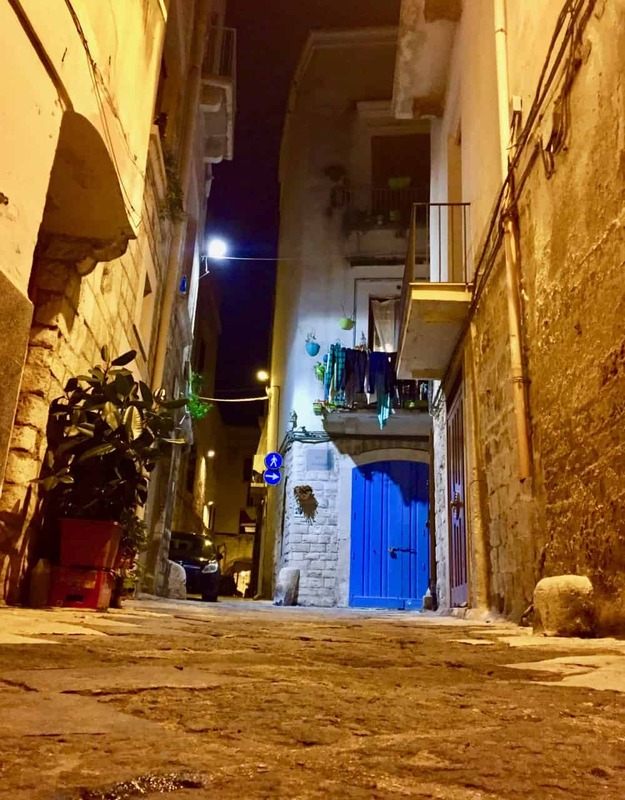 A Bari street at night. 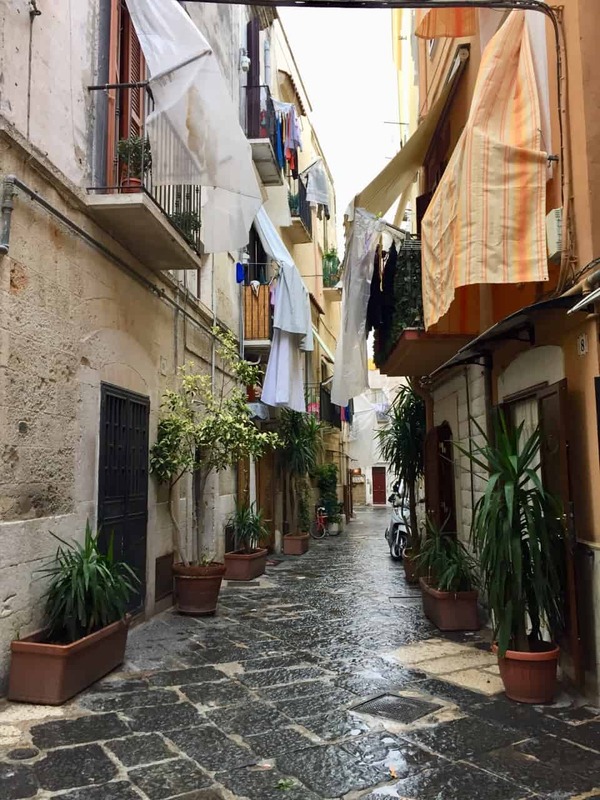 I was in Bari for a short time but I quickly discovered that there are many things to see in Bari and the best way to see them is to simply wander around aimlessly. The historic centre is small so even if you do get lost, it won’t be too long before you find your bearings again. 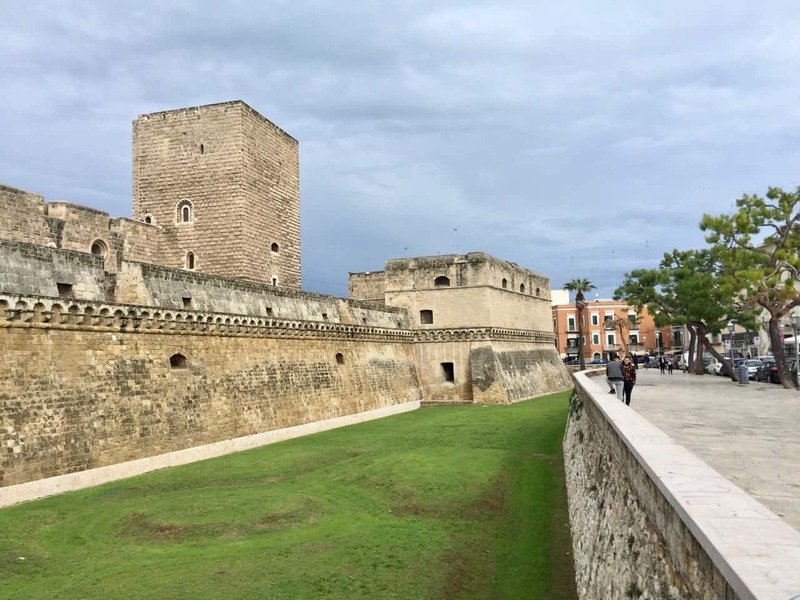 If you’re visiting Puglia, I recommend planning a day or two in Bari. The Bari airport is connected to most major cities in Italy and Europe (London, Frankfurt, Munich, Barcelona, Amsterdam, Istanbul, etc..) by year-round and seasonal services. The airport is a 20-minute taxi or train ride from the city. Search for hotels in Bari. I stayed at Gatto Bianco, a lovely B&B with spacious rooms and free wifi just a few minutes walk from the Old Town. 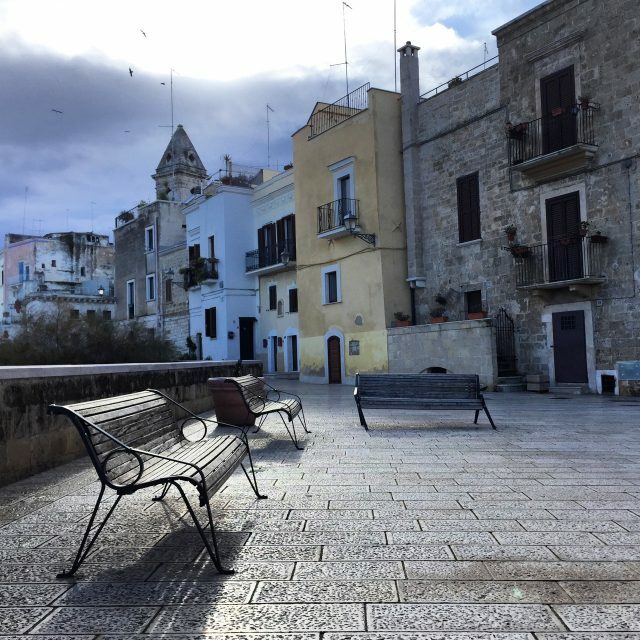 If you’re planning to hire a car and explore more of Puglia before/after a visit to Bari, I recommend picking up/returning your car at the airport. At the airport, you can easily take the train or a taxi to/from the city and this saves you from having to navigate the city’s busy streets and finding a parking space. 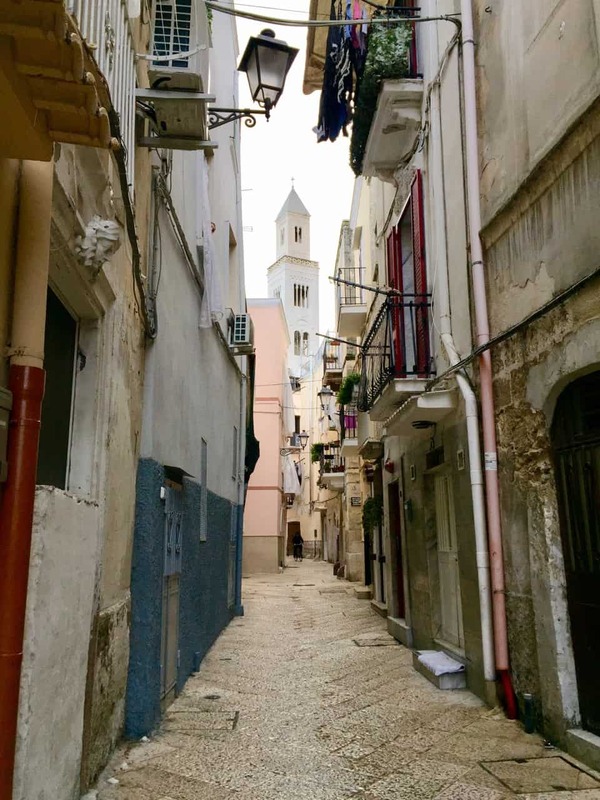 Check out my guide of the best places to visit in Puglia. The ancient city of Matera in the neighbouring region of Basilicata is located about a 45-minute drive away from Bari. 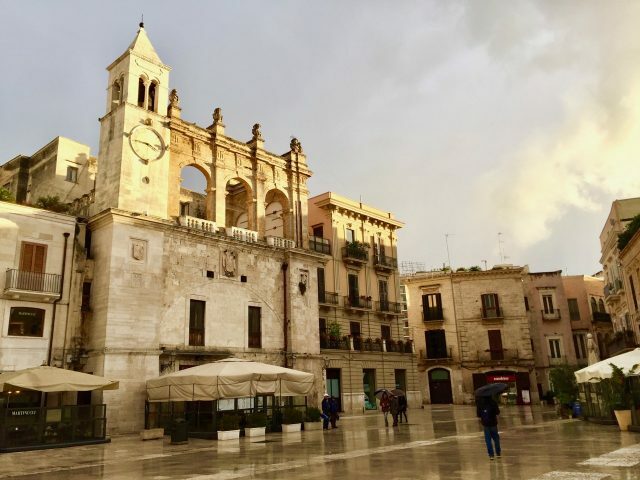 Read about things to do in Matera. 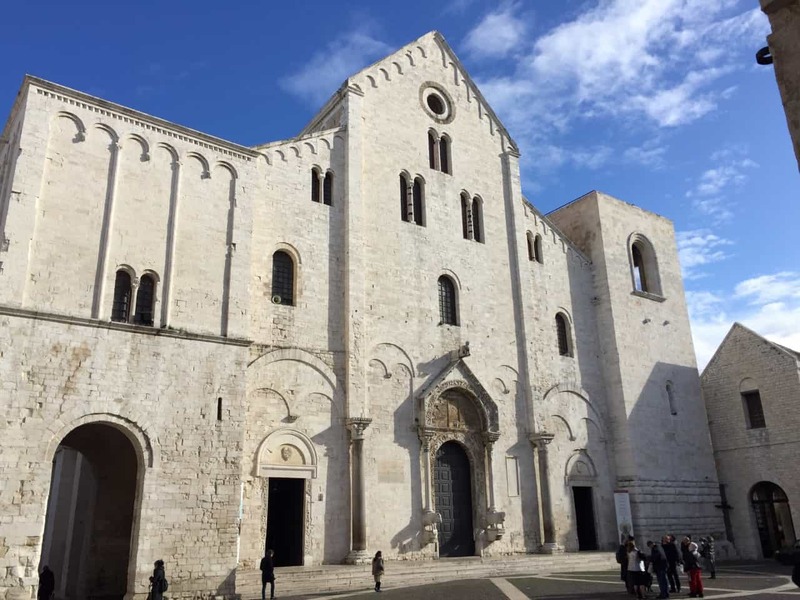 In addition, you can join a rickshaw tour of Bari or a Bari city tour with lunch.